It feels like for maybe half the developed world, 2016 was a year to forget. For the other half, it was a year where the people finally took back some control from the unelected elites. Wherever you sit in this divide, we thought we would start this update with a review of 2016 and what was driving markets and your investment returns last year. One theme that we have is that we expect many of these drivers to remain in place for 2017, so – with humility and acknowledging there will be many surprises to keep us awake at night along the way – we also give our outlook for the year to come. From a polling perspective Brexit was not a surprise. The polls were consistently close indicating that it was more or less a toss-up. However it was a shock for markets because all three major political parties, the vast majority of expert economic opinion and most of our international partners thought it would be a mistake to leave. The conventional wisdom (reflected in the betting markets) was that in a close run race this would be enough to push the vote to Remain. Well, conventional wisdom was wrong. It was wrong again later in the year when US voters opted for an eccentric and risky political outsider in Donald Trump over the stability and continuity that a Clinton presidency offered. Does this mean the world is now a more uncertain and unpredictable place? The short answer – from a market perspective – is no. To illustrate this, below is a chart showing the US equity market (the world’s largest and most important) through 2016. We have shaded in three areas: the first 6 weeks of the year when the market fell over 10%, Brexit and finally the period around and after the US election in November. 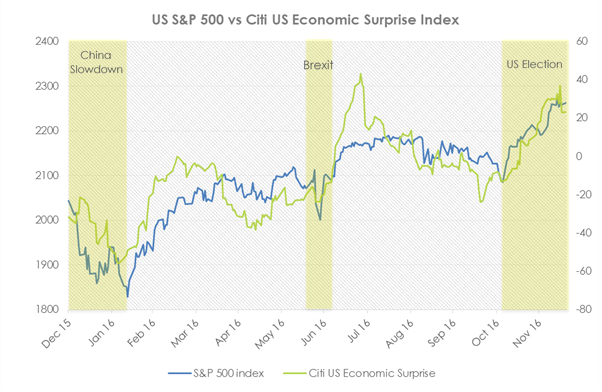 We also show the Citi Economic Surprise index which is a measure of how good the most important US economic numbers were relative to expectations throughout the year. Here we see a different story: data was poor going into the year (and was continuing a disappointing run that began early in 2015. Equity markets fell accordingly fearing a China slowdown, a broader recession and turmoil in the credit markets which were being hit by falling oil prices. The data, however, recovered and equities recovered with it. Around Brexit you can see the sharp V shape caused by the shock of the result. Within a week or so the market was back to pre-Brexit levels, the data rallied sharply and Q3 proved to be the best quarter of the year. After that the data weakened going into the US election and improved sharply thereafter. We are sure that Mr Trump would disagree but it looks to us that it was the underlying US economy that was moving markets in Q4 and not his surprise victory. We actually think we would have seen very similar moves in equities and bonds had Mrs Clinton won. The only difference would have been the explanation given after the event: a Clinton relief rally rather than a Trump “bump”. The conventional wisdom is that the market abhors uncertainty. If this is true and shocks and surprises were on the rise we would expect to see it reflected in market returns. In fact, neither a very independent minded US president nor the UK choosing to leave the European Union looks to have bothered markets much in 2016. The kind of uncertainty they were concerned about remained economic. We expect this to continue into 2017. The good news is that at the end of 2016 and so far into 2017 the economic data has continued to be positive. Growth is also broadly based. China has been performing steadily, Europe has been out-performing what are admittedly very low expectations and the US has looked like it might, finally, 7 years after the Great Recession ended, have a normal looking recovery on its hands. This matters as there is a positive network effect generated when each of the world’s economic regions is expanding. From an economic perspective, you would rather have a stronger neighbour to buy your exports than a weaker one and all neighbours being strong is the best environment of all. This combined with what we think will continue to be very low interest rate regimes in the UK, Japan and Europe create a continuing good environment for corporate profits and investment returns. We therefore remain at a little above our normal risk levels and have a focus on the areas where we see the most upside to a continuing global recovery. This means regions with relatively low valuations (such as Japan) or where the earnings upside looks highest (Europe). For the UK we remain cautious. There has been a relief rally in UK equity markets as the Bank of England rate cut, weaker sterling and the positive effects of stronger growth in the rest of the world have helped cushion the Brexit shock. However, for many areas – including financial services and the City of London – it is hard to be optimistic until the new rules of engagement with the European Union become clearer. Here, we are looking at a divorce. You start by saying that it is not so complicated, let’s just be fair about everything. You end up two years later arguing about CDs you don’t even like, access rights and issues that you did not care about at the start that have now become the be all and end all. The only real winners are the lawyers. You wish you had just played hardball from the beginning. And that is just one person divorcing one person. Here, in effect, it is one person divorcing 27 people at the same time. As Wilbur Ross, Donald Trump’s new Trade Secretary put it: Brexit represents a “God-given opportunity” for other countries to take business away from the UK. This means, after the relief rally we have seen post-Brexit we do not see much of a catalyst from the Brexit negotiations to move UK equity markets or sterling any time in 2017. We remain overweight global equities and continue to think the best opportunities remain outside the UK. It may be that exiting the European Union proves to be a great long term decision for the UK and its economy. In the short term, however, it’s hard to find much to be optimistic about. What could go wrong? If our thesis is that it has been economic fundamentals that have been driving markets then the first risks to look at are economic. Here the economy – to enter the world of Goldilocks for a while – might run too hot or too cold. Too hot is a world where, finally, we see an old-fashioned boom in developed markets. Inflation picks up and – crucially – wages start to increase even faster. Consumers and companies borrow more and increase their leverage. Hotspots and bubbles develop in property and equity markets. This boom scenario is a risk to take seriously as it is the outcome that central banks everywhere are desperately trying to generate. A boom would mean interest rates would rise back closer to historic levels and in that sense the economy would return back to “normal”. The next logical step – putting the cold water of interest rate rises onto an over-heating economy – is a job central banks have done before and would be happy to do again. In this scenario, we think our portfolios are reasonably well positioned. We have a focus on real assets (including equities and property) that should offer some inflation protection. Our equity investments are in regions such as Europe and Japan that have more upside potential if global growth keeps accelerating. We have also added infrastructure investments to client portfolios where the income is designed to rise in line with UK retail price inflation. 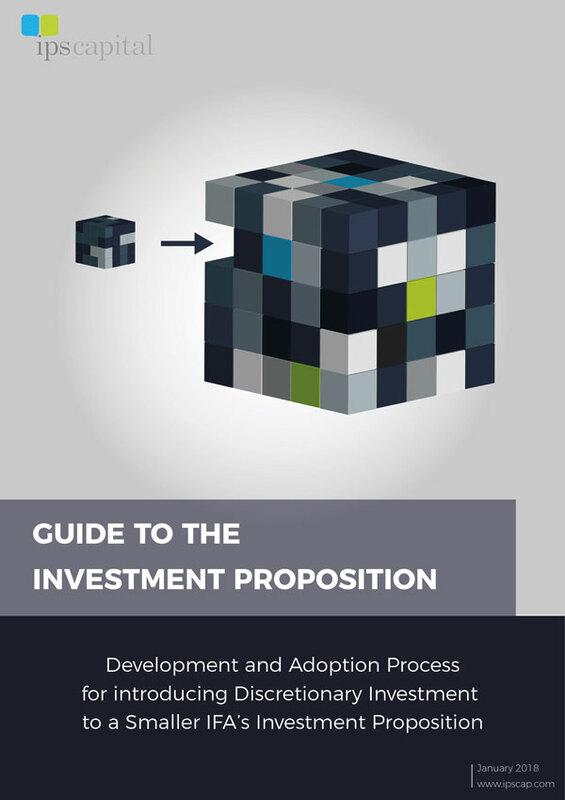 Finally, our absolute return funds are structurally similar to cash plus investments. This means their investment returns should rise in line with interest rates on cash. In the short run, of course, the ups and downs of equity markets will probably make it hard to see the inflation protection embedded in our portfolios. In the longer run, however, we would hope that our investments would generate positive inflation beating returns for clients. What about an economy that runs too cold? In many ways this has been the world we have been in since the 2008 Great Recession. Economies have recovered but far more slowly than they have in the past. Wage rises have been subdued and the lower and middle classes have seen little of the gains from what growth there has been. Here interest rates will remain ultra-low and fixed interest investments – and especially government bonds and high quality corporate bonds – will be the right place to be, as they have been for much of the last seven years. We are currently underweight these investments: partly because of the low returns on offer and partly because we think a slow reflation of the world economy is the more likely outcome. That said, we may be wrong, and it may be that the underwhelming economic performance of the last few years continues on into 2017. Government bonds suffered some sharp losses at the end of 2016 and we will use this opportunity to add some exposure back into client portfolios as protection against a low growth, low interest rate environment. Finally, and probably most importantly, the real risks to markets often come in the form of surprises. Almost by definition, you won’t find genuine surprises on most people’s lists of things to worry about in 2017 (if we could list them here for example then they wouldn’t exactly qualify as much of a surprise). That said, as with 2016, we expect at least one or two to appear in 2017. They could be political (maybe Trump, Putin or European politicians), economic (e.g. a fraud or a major surprise default) or (worst of all) a natural disaster. Sometimes, of course, surprises can be good. But while we hope for the good ones we prepare for the bad ones by continually stress testing our portfolios. Ultimately our protection comes from remaining as diversified as we can be and limiting our exposure to the most volatile markets. We continue to take this approach. We hope and trust this will continue to prove resilient in 2017. We would also like to take this opportunity to wish all our clients and friends of the firm all the best for the coming year. Let’s hope for some pleasant surprises!